This ASCD Study Guide is designed to enhance your understanding and application of the information contained in Teaching with Poverty in Mind, an ASCD book written by Eric Jensen and published in November 2009. You can use the study guide before or after you have read the book, or as you finish each chapter. The study questions provided are not meant to cover all aspects of the book but, rather, to address specific ideas that might warrant further reflection. Most of the questions contained in this study guide are ones you can think about on your own, but you might consider pairing with a colleague or forming a study group with others who have read (or are reading) Teaching with Poverty in Mind. Consider how Jensen's definition of poverty compares with versions that you see or hear at your own school. Which of the six types of poverty (situational, generational, absolute, relative, urban, and rural) are most prevalent at your school? How might the book's definitions of these types of poverty change the way you think about or approach poverty at your school? How can understanding the four primary risk factors caused by poverty (emotional and social challenges, acute and chronic stressors, cognitive lags, and health and safety issues) change perceptions of low-SES students in your school? How does poverty affect students at your school? Discuss strategies that might help you ameliorate these challenges. In what ways are the emotional lives of low-SES kids different from those of kids who come from middle- or upper-income families? What behavioral manifestations of these differences do you observe in school? How will you and your colleagues need to change your own behavior to succeed with these students? How do the three strong "relational" forces that drive students' school behaviors play out at your school? What proactive strategies can you use to influence these domains? How do acute and chronic stressors affect low-SES students' behavior and academic performance at your school? What can you do at your school and in your classroom to alleviate the devastating effects of chronic stress in students? We have learned that the correlations between socioeconomic status and cognitive development can be significant. What effects of poverty on cognitive development have you observed in your own school? Think of some ways you and your colleagues can build low-SES students' core skills, assess their greatest areas of need, and provide hope and support. How have health and safety issues influenced low-SES students' academic achievement at your school? Brainstorm some ways your school can provide improved health services and an "enrichment counterattack" to mitigate these effects. What do we mean when we say the brain has the capacity to change? Looking at the big picture, what are the implications of neural plasticity and gene expression for educators and students? Identify several strategies you can use to increase fluid intelligence in your students. Think of some specific strategies and activities you can use to strengthen the processes in your students' academic operating systems. Does the "enrichment mind-set" prevail at your school? Is every staff member united in the belief that every kid can succeed? If not, what are some steps you can take to change your school's collective mind-set? Do you personally buy into the five factors in the SHARE model? What, exactly, does "support of the whole child" mean? How well is your school meeting all students' needs? Which services and accommodations could your school add to help low-SES kids succeed? With colleagues, assess which data your school most needs and discuss ways to gather them. What role does accountability play in the SHARE model? To strengthen accountability, what changes might your school need to make? Which changes do you see as most essential? What components of an enriched learning environment can your school incorporate into its culture? What obstacles might stand in the way? How can you reduce the impact of those obstacles? Which common "achievement killers" has your school avoided, and which ones persist? Which strategies for success have you found to work for you personally? What new ones can you add to your "toolbox"? In what ways do classroom-level success factors differ from schoolwide success factors? Which set do you have more influence over? Do you agree or disagree with W. James Popham's assertion that "the standard achievement test makers have no interest in selecting test items that will reflect effective instruction," and why? How accountable do you think you should be for low-SES students' achievement, and why? What is the purpose of building hope in the classroom? How much or how little hope do you see in the students you work with? Think of some new strategies that you and your colleagues can use to build hope. Why are arts, athletics, and advancement placement curriculum essential for high-poverty schools? What do you think about policies that encourage more "drill and kill" in math and reading at the expense of these options? Could your students succeed in an advanced curriculum if they had stronger academic operating systems? If so, how can you facilitate that change? Many high-poverty schools that focus on the arts still have high achievement scores. How much art is offered at your school? How much should be offered, in your opinion? If you think your school needs to offer more art classes, how could that be facilitated? Would anything else need to be cut? The better students' academic operating systems are, the better they'll be able to handle the challenges that school and life throw at them. What do you do—and what can you do—every day to strengthen each part of the operating system? What is the role of engagement in the learning process? Why do you think so many educators struggle with this issue? What percentage of classroom time do your students spend actively participating in such engaging activities as writing, discussing, planning, and drawing? List several strategies that you can use in your own classroom. When will you implement these strategies? How can you adapt the steps in Mr. Hawkins's lesson plan to your own classroom? How does Mr. Hawkins's lesson plan match up with the classroom-level SHARE factors described in Chapter 5? What did he do well? What improvements could he make? Contrast Mr. Hawkins's teaching with the teaching in a typical secondary-level class. In your opinion, does his lesson plan contain too much nonacademic time? Too much academic content? Or does it achieve a good middle ground? Does your school expect all teachers to be excellent? How would you rate your own teaching? Has your personal assessment of your own teaching changed? What steps do you plan to take to strengthen your own professional work? When will you begin those? To whom will you be accountable? 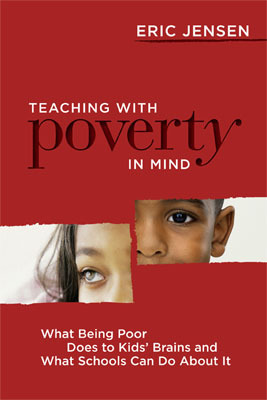 Teaching with Poverty in Mind: What Being Poor Does to Kids' Brains and What Schools Can Do About It was written by Eric Jensen. This 185-page, 6" x 9" book (Stock #109074; ISBN-13: 978-1-4166-0884-4) is available from ASCD for $18.95 (ASCD member) or $23.95 (nonmember). Copyright © 2009 by ASCD. To order a copy, call ASCD at 1-800-933-2723 (in Virginia 1-703-578-9600) and press 2 for the Service Center. Or buy the book from ASCD's Online Store.